I was researching on Pinterest this morning (avoiding doing the laundry, actually) and came across this recipe. Thanks to Zoë François for the idea about how to use the four rapidly-browning bananas hanging limply from the wooden holder in our kitchen. I’ve been using her Artisan Bread in Five Minutes a Day book for years, so I trust what she says (yes, it is that easy to make fresh bread with great texture and taste) Here is her link. Of course, I tweaked the recipe to add more fibre and fruit to the mix. 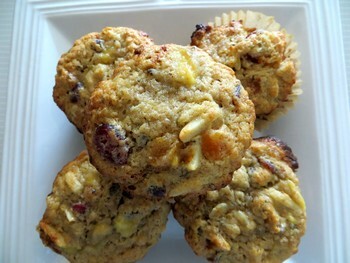 Hub calls them ‘Rocket Muffins’ because of their beneficial impact on the digestive system. Here is my derivative version, which I made into muffins. Makes eighteen 1/2 cup muffins or 1 good-sized loaf. Move the lower rack to the middle of the oven. Preheat the oven to 350 degrees F.
For muffins, line 18 mini-pans with muffin papers (no need to use oil spray – the muffin mixture is very moist). If you’re making a loaf, apply oil spray or butter to a large loaf pan. In a medium-sized bowl, whisk together the flour, baking powder, baking soda, cinnamon, ginger and salt. In a stand mixer fitted with the paddle attachment, cream the softened butter and white and brown sugars on medium speed until they are light and fluffy (4-5 minutes). Scrape the sides and bottom of the bowl with a spatula (make sure you get the ingredients lurking beneath the beaters) and beat for 1 more minute. Add the eggs one at a time and mix for 30 seconds after each addition. Mix in the vanilla and heavy cream and beat for another 30 seconds. Scrape down the sides of the bowl. Add the peeled bananas one at a time (you can mash them beforehand if you wish, but why bother). Mix at low speed for after each addition. Remove the mixer bowl. The contents will look curdled, but not to worry. Using a 1/2 cup measure, scoop the batter into the muffin cups. If using a loaf pan, gently empty into the pan. Bang the pan on the counter to remove air pockets. For a loaf – bake for 50 minutes then check for doneness using the method described above. Remove pan from oven and let cool for 10 minutes, then place a clean towel over the top of the pan, flip it over gently to release the loaf, then place on wire rack to cool. Be patient. Don’t cut into the loaf until it’s cool or the texture may get a bit weird – there’s a chemical/physics-type reaction still going on inside. **Muffins and biscuits do not take kindly to being beaten vigorously. Use a light touch and always leave a few streaks of flour visible. The mixture should be gloppy-looking.